Tom Holland appeared at Ace Comic-Con in Seattle and revealed that he'd like to face off with Venom in the Marvel Cinematic Universe. Holland also "leaked" the title of Spider-Man: Far from Home over the weekend, which may have finally shed some light on the true nature behind his spoiler reputation. Though Holland has truly leaked information in the past, it seems that Sony and Marvel have now exploited it to be a cute marketing ploy, so expect a lot more "leaks" from the young MCU star in the future. While answering questions at Ace Comic-Con, Tom Holland was asked which Spider-Man villain he would like to see join the MCU. Holland gave the question careful consideration, which may have been genuinely used to keep from spoiling anything for Spider-Man: Homecoming 2 or the future of the MCU. After thinking, Holland replied, "Maybe Venom?" This is an interesting answer, especially since it has been rumored that Peter Parker will have a cameo in the standalone Venom movie, which is currently in post-production. 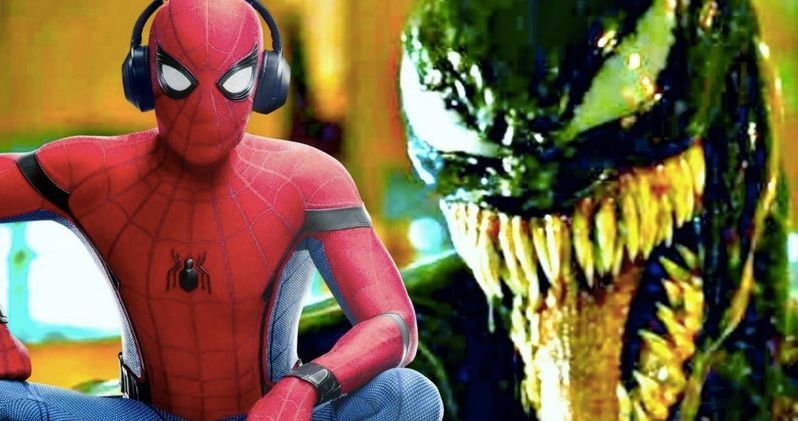 Sony's Venom will hit theaters in October of this year, and there is still a lot of mystery surrounding the project. The film is loosely based off of the Lethal Protector comic series and by the looks of the promotional material, it's going to be action packed. But could we really see the symbiote end up in the Marvel Cinematic Universe in the future? For now, that seems unlikely, but since the MCU is said to be going in a cosmic direction for Phase 4, it's not entirely out of the question to possibly see Tom Hardy's Venom and Carnage make appearances. As for Spider-Man: Homecoming 2, the official title is Spider-Man: Far from Home, according to Tom Holland. While Venom won't be making an appearance, it's been heavily reported that Jake Gyllenhaal will portray the villainous Mysterio. It's believed that the sequel will take Spidey to London and other parts of the world, hence the title. Filming is expected to begin this summer, which will see Spider-Man back in action after the events of Infinity War and the upcoming Avengers 4. Many MCU devotees are wondering how Peter Parker will return after turning to dust in Tony Stark's arms on Titan. While it seems unlikely that Tom Hardy's Venom will join up with the MCU, it could still happen at some point. For now, Sony is busy developing their Spider-Man universe with Silver and Black, the Morbius, the Living Vampire, Nightwatch, and the recently announced Silk movie. It will be interesting to see if Spider-Man makes an appearance in any of the projects or vice versa. With Venom opening on October 5th, we'll learn soon enough. Spider-Man: Homecoming 2 will hit theaters on July 5th, 2019, but we'll see Peter Parker on the big screen again before that when Avengers 4 opens in May of 2019. Head over to ComicBook to read more about what Tom Holland had to say about Venom and the MCU.